There’s nothing like the smell of coffee brewing in the morning. Want that wonderful smell of coffee, even when you’re not at a coffee shop or brewing a cup at home? 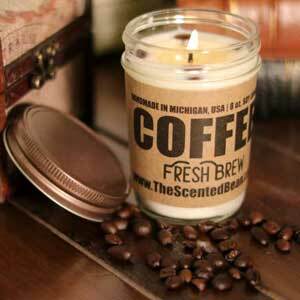 The Scented Bean specializes in handcrafting the best coffee soy candles and melts in the world. The candles look and smell like a real cup of coffee. Part of what makes them so special is that each candle comes with a sleeve around it, just like a carry-out from a coffee shop. 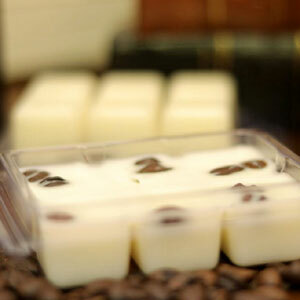 The candles and melts also contain real coffee beans. If you’re a coffee fanatic, you will absolutely love the fragrance of these coffee scented candles and wax melts – without the caffeine. A lot of us like to burn or melt scented candles at home. There are so many to choose from. But, if you love a good cup of coffee – you’re gonna love The Scented Bean Coffee Candles and Melts, all that smell like coffee! Flavors include Cafe Mocha, Fresh Brew, Hazelnut, Michigan Cherry Coffee, French Vanilla, Caramel Macchiato, Caramel Cinnamon Latte and Mint Mocha Latte which are all hand made in their Novi, Michigan warehouse. Cafe Mocha Fragrance notes reminiscent of fresh brewed coffee, chocolate syrup, creamy vanilla, and marshmallows. The scent throw is light to medium. Fresh Brew This fragrance smells just like fresh brewed coffee without the bitterness. It has just a SLIGHT sweet smell. It is best described as an Espresso coffee fragrance with a sweet vanilla musk. The scent throw is light to medium. Hazelnut This fragrance is an aroma of freshly brewed Arabica coffee beans combined with creamy vanilla with a base note of nutty hazelnuts. The scent throw is light to medium. 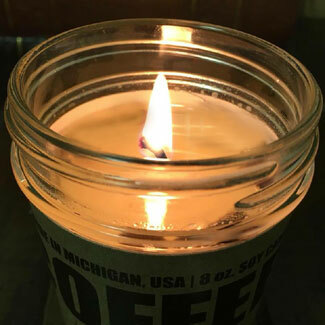 Michigan Cherry Coffee A sweet floral cherry blossom fragrance with a woody amber background which is enhanced by a white musk base mixed with fresh brewed coffee fragrance. The scent throw is light to medium. French Vanilla A sugary, vanilla aroma with just the right amount of fresh brewed coffee. The scent throw is light to medium. Caramel Macchiato Creamy caramel notes are blended with coconut milk, coffee beans and cocoa powder on a base of sweet, frothy vanilla to create the irresistible scent of caramel macchiato. The scent throw is light to medium. Caramel Cinnamon Latte A fabulous delicious coffee blend of creamy vanilla, spicy cinnamon, hot sweet caramel and fresh, strong home brewed coffee. The caramel and cinnamon blended with the creamy vanilla floats to the top with the fresh coffee scent blending and settling to the bottom. A wonderful rich, aromatic blend! Mint Mocha Latte It’s a perfect balance of creamed peppermint and crisp cookie wafers. Rich cocoa and hints of coffee bean blend with cookie dough for the yummy fragrance signature. A lingering undertone of vanilla sugar sweetens the dessert treat to perfection. Buy The Scented Bean Coffee Soy Candles!